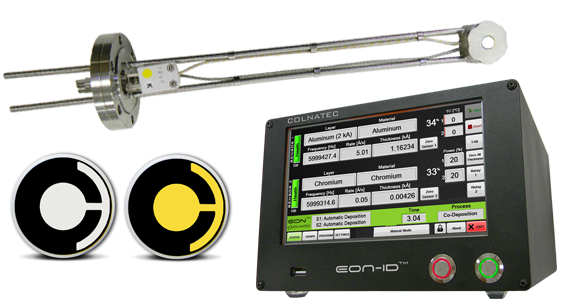 Colnatec’s Phoenix™ temperature measuring film thickness sensor head, combined with the Eon-LT™ or Eon-ID™ film thickness monitor and Eon™ software provides a QCM system that operates continuously within a 20-500°C temperature range (perfect for in-situ metrology). Employing Colnatec proprietary RC™ crystals, Phoenix™ system can maintain a highly stable measurement environment, free from the high noise levels that occur in antiquated “AT-cut” crystals that are designed to operate at just 20°C and that fluctuate with source radiation. In addition to being naturally suited to ALD processes, the Phoenix™ system is also ideal for CVD, MBE, optical thin film coating, superconductor and general thin film deposition systems. If you need to independently control the sensor head temperature from the process environment – as would be necessary during ALD precursor development – or perform surface science studies, Colnatec offers a sensor head featuring an embedded solid-state heater capable of heating the sensor to 500°C. The Tempe™ sensor head, combined with the Eon™ temperature controlling software, is designed to duplicate ALD conditions occurring at the substrate level and takes the guesswork out of determining the optimum temperature for deposition. A crystal heated to 100° C operates five times longer for monitoring optical thin films like MgF2, SiO2, TiO2 and eliminates half the noise. The revolutionary ability of Tempe™ system to measure frequency and temperature simultaneously allows for real-time correction of any natural frequency drift in the crystal during heating. Any process that requires heated crystals or high measurement accuracy will see exponential improvement, leading to the highest accuracy possible as well as enabling continuous crystal operation without cooling. Even when used as a low-temperature sensor (20°C) for measurement, the Tempe™ Eon™ is equipped with a “self-cleaning” feature that uses elevated temperatures to remove any deposited materials; thus, purifying the crystal. And because it is able to maintain temperatures within a range of 50-500ºC as well as initiate a self-cleaning cycle, the Tempe™ sensor head excels at extending crystal life, reducing interruptions in a continuous process environment, and minimizing errors from rate noise. For these reasons, the Tempe™ system represents an almost indestructible sensor for roll-to-roll and continuous production OLED lines. And most impressively, the temperature variability of Tempe™ sensor can be used in co-deposition systems to eliminate “cross talk” between evaporant streams. So no matter how fast your deposition-rate, Tempe™ will be able to keep up!